This is quite simply one of the best glider-motion chairs ever brought to market. 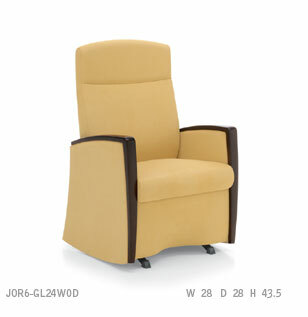 Available in two sizes, the unique curvature and support points of the Jordan Glider encourages an ergonomically-correct sitting posture that is also exceptionally comfortable. This chair, along with the other Jordan products, has been designed with pronounced lower lumbar and thoracic support, and the canted seat with a "waterfall" front is designed to prevent discomfort for legs and hips, while promoting good circulation. The seat, arms and the recessed front panel are designed to allow safer and easier ingress and egress. A slight flexing action in the back promotes an upright sitting position that is stll pleasingly comfortable.